Halfway through a walk between Bow Brickhill and Leighton Buzzard, this pub came as a welcome sight down in its dell. The beer choice is unimaginative but a pint of Tribute was very well kept while a game pie and mushroom risotto were pleasingly home made. The public bar is diminutive so arrive early while the lounge bar has tables set for diners which is a bit off putting. Overall, a good, unpretentious local. An attractive pub at the centre of the village, it looks very inviting with it’s hanging baskets along the front and there are great views across the valley from the beer garden at the back. The area is a popular spot with walkers and this means it can get very busy in the summer months. Inside, it’s divided in to two rooms with the one on the right being very much more geared up for dining as all the tables were laid up for food. The left hand bar is a square room with red carpet on the floor, a few quarry tiles around the bar counter and chunky pine tables. There are a few small oak strips on the ceiling and a brick fire-place to one side which had piles of logs stacked up ready for the cold weather. A number of artistic wildlife drawings were on the wall, and there was also a plasma stuck up next to the fire-place, although this was not in use on my visit. Clientele appeared to be predominantly workman types stopping for a pint after work. This seemed rather at odds with the character of the pub, and made for a less than relaxing appearance with their loud voices and laughter. It may of course be completely different at other times though. The menu offered a decent selection of dishes, although perhaps a cut above your usual “pub grub” with most of the main courses being around the £10 - £12 mark. In addition to the printed menu, there was a specials board that listed a further half a dozen options. My Thai Green Curry was a decent and tasty dish, although perhaps not the most authentic version of the genre. Beers on tap were Greene King IPA, St. Austell’s Trelawney and London Pride. The solitary cider was Strongbow, unfortunately. 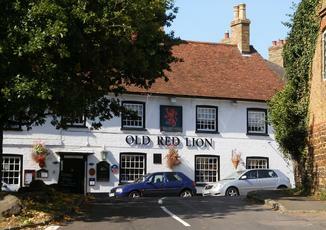 I used to love coming to this pub, although I have always had to put up with a cold and lofty reception from the staff. I am a social Care Worker, and a few weeks ago I bought a few of my severely disabled clients here. The staff were very rude about having to provide receipts for the drinks that each client purchased because it was too much effort for them. I then went back a few days ago, I had an absolutely disgusting reception from the staff. I found them to be rude and uncooperative to the point of being down right nasty. My friend and I ordered food and tap water. When I went back to the bar to ask for more tap water I was asked to pay £1.20. I politely refused and got the water from a bottle in my car and went to sit back down in the pub garden to eat the food that we had purchased in this establishment. The owner of the pub came storming out, took the food and glasses from beneath the nose of my friend and ordered us to leave because we had caused the waste of two glasses of water with their ice and their lemon in. I have never ever written a review about a pub, but never before have I experienced such awful treatment by any body, let alone people in the public service industry. I am thoroughly disgusted. Its such a shame too, because the views are beautiful and the location is lovely. Went here on Fathers Day for lunch; 11 of us all told and without exception we had an excellent time. My focus in pubs is always the beer and there were two available, Tring Fanny Ebbs and Flowers Original. Both in superb condition. From the barrels outside, it seems that they always have a Tring beer and one other. That said we sat down for a superb lunch (mussels recommended), after which everyone was really impressed. For 11 of us the bill including 5 bottles of wine was only just over �300 which I think is exceptional VFM. The view from the end of the terraced garden is spectacular. Didn't experience any problems with service, which was business-like rather than friendly. Beautiful views, nice food, nice staff.... but if your not a local you will wait to get served!